yourFXguide-It was about 3-4 years ago, I was day dreaming, which is the one of my most favorite work I do. I do it everyday whenever I have free time that I can rarely manage now a days.So, that time I was thinking, if I could identify the tops and bottoms of the forex market. I was thinking, if I could develop a mathematical formula that would tell me what is the highest price market would reach in a certain time period. Hahaha !!! I am crazy, yes I am. I am still trying to find a tool that will help me to find the tops and bottoms of currency markets. In my last post, I talked about the way to apply the percentage of short and long positions of non commercials in understanding market sentiment. 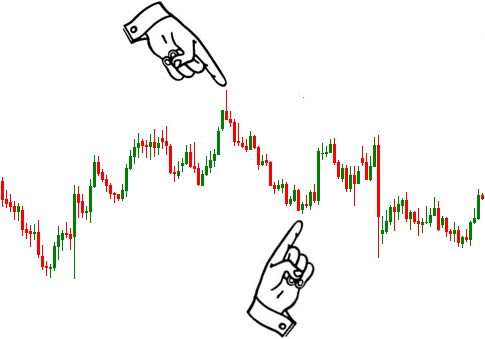 Now, I am going to explain the way to find market tops and market bottoms. How to find the tops and bottoms of the markets with percentage of non commercial long positions ? Applying the above formula, we can find percentage of non commercial long positions. I calculated percentage of non commercial long positions in last five years. I did it very easily with MS Excel work sheet. With the results found, I drawn the line chart presented below. In the above chart, we see the percentage of non commercial long positions in last five years. To apply this chart to find the market tops and bottoms, we should remember that when the percentage of non commercial long position is at historical high the market is about to make a top, and when it is historically low, market is about to make a bottom. Most important question at this point is "Why do this chart act like that ?" To answer this question, let me give you some examples from real price chart. On 10th January 2012 cot report of Euro currency shows that the 14% non commercial traders were long, which also means 86% non commercial traders were short. At the next week on 17th January 2012 cot report of euro currency shows 13% non commercial traders were long, which also indicates 87% non commercial traders were short. To understand the effects of above stated set of information, I opened the daily chart of eur/usd currency pair. 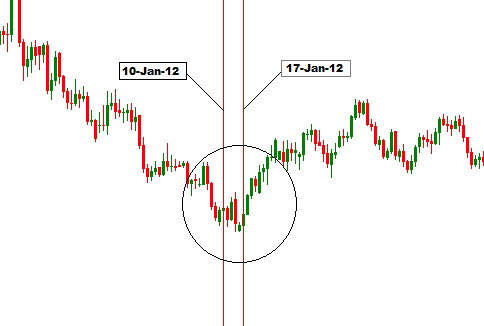 I was surprised when I saw the eur/usd currency pair made a bottom between 10th January 2012 and 17th January 2012. 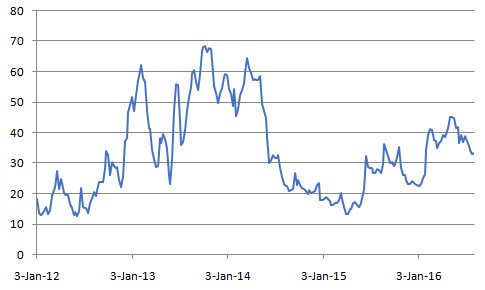 This was one of the bottoms we found with percentage of non commercial long positions. Let's find a top with percentage of non commercial long positions. On 3rd May 2011 the euro currency cot report showed that the non commercial traders were 82% long on the currency, which also meant 18% of the non commercial traders were short.In the previous week on 26th April 2011 the report showed that 74% non commercial traders were long on the currency, which also meant 26% non commercial traders were short. 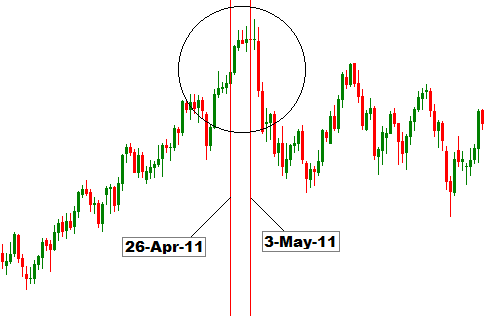 On the daily chart of eur/usd currency pair presented above, we can see between 3rd May 2011 and 26th April 2011 eur/usd currency pair made a historical top. Okay !!! I know you are impressed and started dreaming to be a millionaire over night. Close your mouth, hide you teeth. In this world there is nothing easy. There are some challenges that the traders are to face while applying this technique of finding market tops and bottoms. Before writing about the challenges, let me write some more words on this technique. When in given week the percentage of non commercial long position is 13%, that also means 87% non commercial are short. Some of the traders may think, if 87% non commercial traders are short, bearish sentiment in the market is stronger. But actual situation is different. For example, if in a market 100 traders are participating and 87 are in sell side, this is an oversold condition. And after that the traders are supposed to start buying. This is not a time of strong bearish sentiment rather an extreme time of increasing the bullish sentiment. Most common question that smart traders will ask, what is the highest and lowest level of percentage of non commercial short and long positions to find the market tops and bottoms? This is the hardest question to answer. Another confusing situation arises when percentage of non commercial long positions remain lower or higher for a certain period of time. I hope my research will find the answer of this questions.